One of the skills that the Little One has to master is gross motor skill. Not only will it enable the Little One to be able to sit, crawl, walk, or jump, gross motor skill is needed in self-reliance to take care of himself/herself when he/she grows up. In Howard Gardner's theory of multiple intelligences, motor skills are included into kinesthetic intelligence. Psychologists from Harvard University argue that the indicator of intelligence is not only seen from one aspect only, but covers many areas in everyday life that are linguistic, kinesthetic, mathematical logic, musical, visual spatial, interpersonal, intrapersonal, and naturalist. The theory of multiple intelligences is then used as the basis for making the growth and development site Morinaga Multiple Intelligence Play Plan. Making tunnels from used cartons so that the Little One can crawl in and out. Train the Little to do a squat / stand movement, by putting the toys on the floor. This movement will train his/her balance. Let the Little One helps Mommy in doing some simple homework such as putting dirty clothes into a basket of clothes and picking up the toys after the Little One finished playing. Teach the Little One how to go up and down right the ladder properly. Hold one of his/her hands or ask him/her to hold on to the banister. Play slide, swings and other games in the park. Train the Little One to climb in a playground that uses poles or climbing-hoops. Put some objects on the floor, give space each other, and ask the Little One to run between the obstacles. Teach Your Little One to throw a light ball up. Walking on the balance board. Teach your Little One to ride a two-wheeler and to wear shoes. Perform sports activities or other physical activities outside the home. No other activity is preferred by the Little One rather than playing. This activity can train multiple intelligences. Inside the Morinaga Multiple Intelligence Play Plan website, Mommy can use the facility of identification of multiple intelligences so that the dominant intelligence of your Little One can be known. 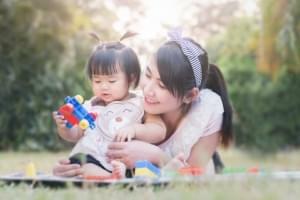 Afterwards, Mommy can find creative play ideas that have been adapted to the age category and the type of multiple intelligences. In order for all aspects of intelligence of your Little One can be stimulated properly, create a play plan that consists of several games every day. Remember, Mommy, proper stimulation is necessary to support the growth and development of the Little One. One of the abilities of the child much awaited by parents is when they say their first words. But, what if the child is unable to say a single word?